In Désser City, around one hundred years ago, Hoopa Unbound appears boasting how strong it is. It summons Kyogre and Groudon from its rings, battling them back and impressing the townspeople, and asking if they were surprised. But when it appears again, summoning Reshiram, Zekrom and Regigigas, the battle between all of the legends begins to destroy the town. The townspeople cry out for it to stop, but Hoopa is too determined to show off. Suddenly, a man appears, an Arceus necklace around his neck, holding the Prison Bottle. 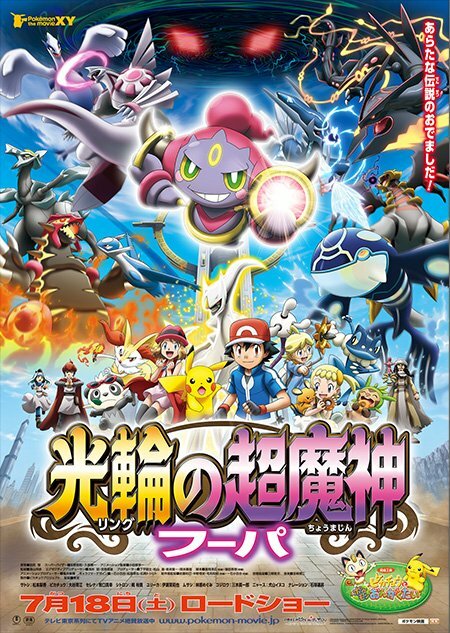 Hoopa Unbound is sucked into the bottle, saving the town and halting its rampage. Years later, a young man is searching in the Valley of Arche. In a cave, after using Solrock's flash to see, he discovers the Prison Bottle. Delighted, he grabs it, but is soon posessed by the dark power within. Meanwhile, Ash, Clemont, Serena and Bonnie are relaxing at a Pokemon Center near Désser City. Ash and Bonnie swim, Clemont works on an invention, and Serena brings out donuts for everyone. While they enjoy the donuts, they begin to disappear into Hoopa's portals. Ash finally spots the arm reaching out in time to grab hold, and he and Pikachu are pulled through. They find themselves on the other side of Désser City with Hoopa, who asks if they were surprised. Ash says he was very surprised. Wanting to delight Ash more, Hoopa, who names Ash Saton and Pikachu, Pikan, opens two portals, through which hundreds of Pikachu come through, including a full set of Cosplay Pikachu. Ash is startled, but when Hoopa quizzes him on which one is his own, Ash finds Pikachu within a single moment. Hoopa seems let down that Ash didn't have a harder time. Mary appears, and tells Hoopa to return all the Pikachu it "borrowed". Pikachu gets up on the railing to command all the Pikachus to return, which they do, impressing Hoopa. Mary introduces herself as the one taking care of Hoopa. Ash then drags Clemont, Bonnie, Serena and all their stuff through the rings. They decide to visit the Tower, and think it would be easy to go through the rings to get there, only Hoopa is unable to pass through its own rings. They decide to walk. Then, the possessed man, Barza, arrives on his Braviary, and instantly opens the Prison Bottle. The darkness envelopes Hoopa, who transforms into Hoopa Unbound. Barza returns to normal, and both heand Mary are very happy to see Hoopa Unbound, glad Hoopa got its power back. But Hoopa Unbound instantly begins to smash things, its tail destroying a donut shop, and whacking Team Rocket's balloon away as they were plotting to steal the bottle. They get Hoopa Unbound's power back into the bottle, but learn quickly that by touching it, they will be posessed. Clemont happily shows off his new invention, a device that can hold the bottle up with electric waves, and carries it in his Aipom Arm so nobody has to touch it. Hoopa is absolutely terrified of the bottle and the power inside of it, shaking and whimpering. They sit down to eat, and Barza explains Hoopa's story. One hundred years ago, Hoopa Unbound began to appear in town, eating food and causing problems. But the townspeople came to love it when he would battle Pokemon to entertain them, and made them very happy. It also brought much gold, and Désser City grew from a tiny village to a great city. Only when it began to summon more powerful legendaries, and grew more obsessed with showing off its power even if it destroyed the town, did the townspeople have to do something to stop it. The man who stopped Hoopa was Mary and Barza's great grandfather. They show off their Arceus necklaces, and Ash thinks he recognizes it. Clemont explains Arceus is the one who is said to have created all things. Mary and Barza explain how their family is connected to Arceus' power. They tell how their great grandfather could use it to control Hoopa, who would throw great tantrums screaming for him to give back its power. Mary and Barza grew up with Hoopa like siblings, getting into mischief and playing together, even healing Hoopa when it grew very sick when taken into the Valley or Arche. It is clear they love Hoopa as family, and taught it many things about helping others and getting along. Even their great grandfather accepted Hoopa as family. Team Rocket appears in their balloon, thinking the Prison Bottle will power up their Pokemon. The instant Meowth takes hold of it, though, he becomes possessed, and opens the bottle to unleash Hoopa Unbound's power. Hoopa fights the power, too afraid of vanishing if they become one again, and is able to keep it at bay, but Hoopa Unbound then develops as a separate Pokemon. In the struggle, the Prison Bottle explodes. Hoopa summons Lugia to fight Hoopa Unbound after Team Rocket is blasted away and Barza's Braviary is defeated. Lugia distracts Hoopa Unbound as they make their escape. Mary and Barza know they can make a new bottle at the Tower with the power of earth, fire, and water. They decide to use Serena's Braixen, Ash's Frogadier, and using a ring, Bonnie goes to the desert to ask for Hippopotas for its help, and brings it along. Ash stays with Hoopa while the rest head to the tower to make a new bottle. While hiding from Hoopa Unbound, who is still fighting Lugia, Ash and Hoopa begin to talk. Hoopa promises that once strong enough, it will make any of Ash's wishes come true. Ash says his wish is to become a Pokemon Master, and Hoopa says it will make it happen. Ash refuses, though, saying that is a dream he plans to attain by himself. Hoopa is absolutely shocked Ash plans to attain his own dream without using rings or magic wishes. Ash they talks to Hoopa about how this Hoopa Unbound seems to be a shadow of Hoopa, and it needs to learn to make peace with itself, perhaps, to solve this crisis. Hoopa Unbound appears in a ring, searching for them with its giant hand. Right when they are about to be caught, Lugia appears and carries them away on its back. But Hoopa Unbound tricks Lugia into flying into a ring, sending it back to its ocean home, and Ash and Hoopa powerless. Hoopa summons Latios, Latias and (shiny) Rayquaza. Ash, Hoopa and Pikachu ride on Latios and Latias while Rayquaza helps to battle Unbound. Ash commands the Pokemon's attacks, but Unbound summons Dialga, Palkia, Giratina, Kyurem, Groudon, and Kyogre. At the Tower, the others are hard at work making a new Prison Bottle, using the powers of fire, earth and water. Clemont commands Frogadier, Bonnie commands Hippopotas, and Serena commands her Braixen, while Mary and Barza use their powers. The bottle begins to form. When the six legendaries summoned by Unbound begin to attack, Rayquaza, Latios and Latias all Mega Evolve. Kyurem becomes Black Kyurem, then White Kyurem, as the all out brawl continues over the city. When Ash falls off, Hoopa uses a ring to save him, dropping him back onto Latios' back. As the bottle's progress continues, Unbound becomes aware of it, and turns to focus attacking the Tower. Ash uses the Latties and Rayquaza's power to protect it, but it cannot withstand the combined power of the other six legendaries attacking it over and over. But the new bottle is finished in time, and instantly freezes Unbound just before it can deliver a blow to Ash, and the other six legendaries fighting for Unbound also instantly stop. Ash ends up holding the bottle by accident and is instantly possessed. He begins to yell at Hoopa to vanish, but Hoopa tries to be brave, giving good memories to its shadow through Ash, showing Unbound the time it spend with Mary and Barza, and how it was accepted as family. Unbound's fury begins to fade, and Hoopa is able to make peace with its shadow, freeing Ash from the posession. As things begin to calm down, all the watching legendaries tell Hoopa how surprised they were, making it very happy. Just then, space begins to collapse around the tower, trapping everyone, including hundreds of tourists, in one area. Barza thinks it is the result of all of the legendaries being summoned to this one spot. Palkia, Dialga and others try to stop it to no avail. Ash even tries to use Pikachu's Thunderbolt on it, also to no avail. Hoopa decides to become Hoopa Unbound, strong enough to help, and does so with confidence, at peace now with its shadow. Using its rings, it evacuates everybody, then returns to small size to also try to escape. Hoopa, however, still cannot pass through its own rings, and is doomed to vanish into the black hole destroying the tower. Ash and Barza remain to try to help Hoopa, thinking if it believes in itself, it can make it through. Hoopa recalls their great grandfather saying something similar, and with enough faith, and a mysterious golden light halting the space rift for a moment, is able to get through with enough time. The Tower and surrounding area are destroyed, but everyone is safe, and they look up in time to see Arceus fly away, having helped them. The other legendaries also make their way home, on their own and not through rings. Hoopa promises to help restore the tower, and does so as Hoopa Unbound, once again a boon to the town and completely in control of its own powers. Ash and company head on to their next adventure.